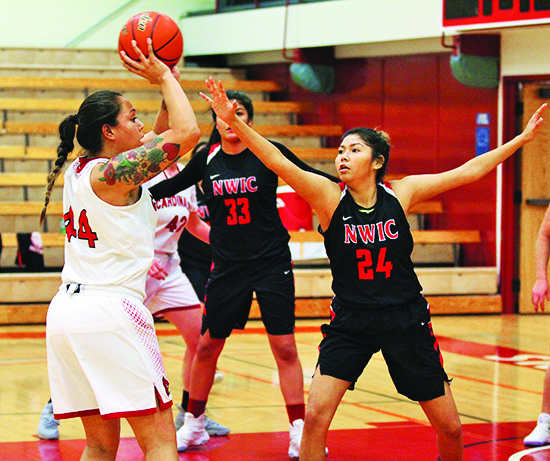 Tulalip tribal members Adiya Jones (left) and Kanoa Enick (right) are matched up for the first time as collegiate adversaries. They’ve grown up together on the Tulalip Reservation playing more games of rez ball than can be remembered. 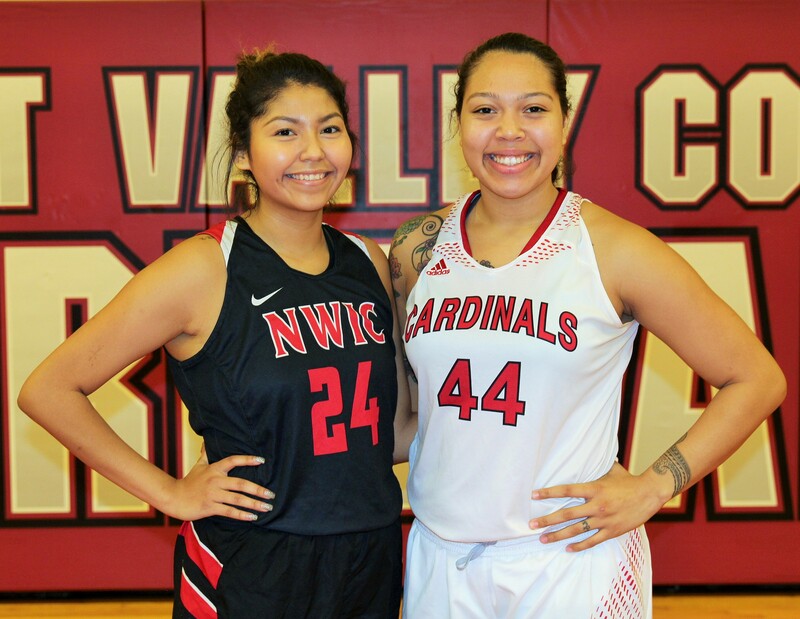 Years and years of dribbling, rebounding, and hearing the net swish has created countless memories on the hardwood, but an all-new memory was created for Tulalip tribal members Adiya Jones and Kanoa Enick when they matched up for the first time as collegiate adversaries. 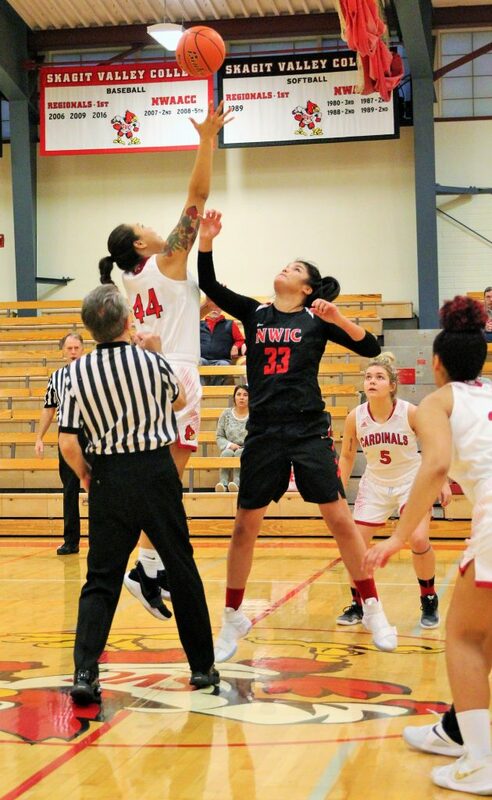 In her second year playing for Skagit Valley Community College, Adiya has stepped up and taken the reigns as the team’s unquestioned leader. She is the primary playmaker on offense while also anchoring the team’s defense. “Adiya is our best player and there’s a reason why. She has a high basketball I.Q., she’s so smooth with the ball, has a great shooting touch, and she’s a willing passer; making her a tremendous asset to our team,” beams Steve Epperson, Skagit’s Athletic Director and Women’s Basketball Coach. “Over the last few games she’s rebounded the heck out of the basketball as well. Meanwhile, Kanoa recently decided to test her medal at Northwest Indian College (NWIC) by enrolling in Winter quarter. Her appetite for getting buckets still strong, she walked onto the women’s basketball team and is quickly showing promise. And so the stage was set for the two home-grown college athletes to face-off for the first-time ever. The historical moment took place at the Lummi High School gym, the home court for NWIC, on Friday, December 5. Adiya shined while leading her team with 24-points, but it was Kanoa’s NWIC team taking the W in a 64-61 nail biter. The following day, the two team’s played once again, this time in Mt. Vernon, giving Adiya’s Skagit squad the opportunity for payback. There were several Tulalip fans in the crowd who journeyed to watch the matchup. Skagit came away with a convincing 66-35 W the second time around, giving both Tulalip women a victory over the other. Following their second matchup in as many days, Adiya and Kanoa reflected on this new experience.